Easy Capture is a free, but discontinued screen capture tool which can save its captured images as BMP, JPG, GIF, PNG or as TIFF images. After installing Easy Capture, you will be able to take entire screen captures of your desktop or just of certain regions you define. Easy Capture is also able to create scrolling images of web pages if you desire. Once a screen capture has been created, you can use the EasyCapture's editing functions to flip, rotate or resize the images. Version 1.2.0 is a freeware program which does not have restrictions and it's free so it doesn't cost anything. 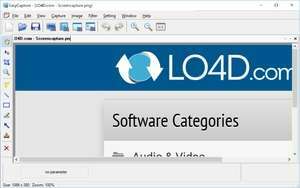 For security reasons, you should also check out the EasyCapture download at LO4D.com which includes virus and malware tests. Additional screenshots of this application download may be available, too.